Only this version is naturally sweetened, has a no-fuss almond-oat crust, requires just 10 ingredients, and is made entirely in the blender. Yeah, I’m bringin’ the heat (is that still something the kids say?). While I do love a traditional pumpkin pie, this one may be slightly better because of the no-fuss crust! Just blend oats and almond flour and press into a baking dish instead of mixing with a pastry cutter, rolling and then transferring the crust to a pie pan. NEWS! I have an update for my go-to almond oat crust: Almond flour in place of whole almonds/meal. Almond flour is made of blanched almonds instead of raw almonds and creates a lighter texture and less harsh almond flavor in baked goods. It’s an easy swap that makes the crust even more perfect and undetectably gluten free! I’ve found almond flour to be generally more expensive than almond meal, but I’ve found it’s worth it for the better texture and flavor. Plus, I’ve been ordering a 2-lb. bag of WellBee’s from Amazon for a better price than store-bought and had great success with it! I did a little research and found out that not all almond flours are made equal, so I’d highly recommend trying this brand first! I plan to use almond flour a little more around here, especially in gluten free baking as it seems to be superior (to almond meal) in gluten-free baked goods. These bars would make the perfect dessert to bring along to holiday gatherings. They’re so much easier to make than a traditional pie, yet deliver the same satisfying results! If you’re really into pumpkin pie (like, for real), check out my other adaptations: Pumpkin Pie Parfaits, Mini Pumpkin Pies, Pumpkin Pie Oats, Pumpkin Pie Cheesecake, Pumpkin Pie Ice Cream, Pumpkin Pie Shooters, No-Bake Pumpkin Pie. If you try this recipe, let us know! Leave a comment, rate it, and don’t forget to tag a photo #minimalistbaker on Instagram so we can see. Happy baking, friends! 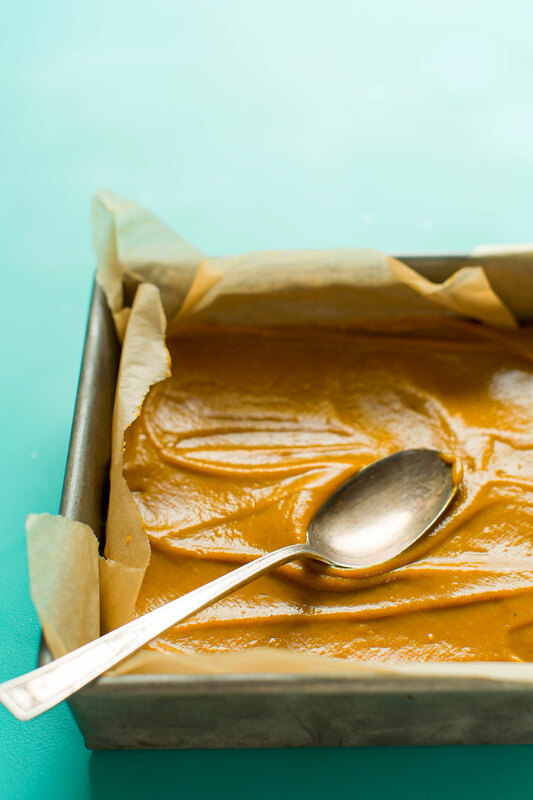 Crazy-delicious Pumpkin Pie Bars made entirely in the blender with 10 ingredients! Plus, naturally sweetened and a no-fuss crust. The perfect plant-based, gluten-free dessert for fall! Preheat oven to 350 degrees F (176 C) and line an 8x8-inch baking dish with parchment paper (adjust number/size of dish if altering batch size). Make crust by adding oats to a blender (or food processor) and blending/mixing until you reach the consistency of oat flour (if using raw almonds, mix them with the oats at this time). Add almond flour (not meal*), sea salt, coconut sugar and mix once more. Then add maple syrup and melted coconut oil and mix/pulse to combine. Depending on device, you may need to use a spoon to scrape around the edges to ensure the crust is completely mixed. If it appears or feels too dry, add more coconut oil. Add crust to the parchment-lined baking dish and shake to evenly disperse, then lay down parchment paper on top and use a flat-bottomed object (such as a liquid measuring cup or drinking glass) and pressing down to pack the crust into place, making an even, firmly packed layer. Bake for 20 minutes, then set aside to cool. In the meantime, add all filling ingredients to the blender (or food processor) and blend until smooth, scraping down sides as needed. Taste and adjust seasonings as needed, adding more maple syrup or coconut sugar for sweetness, or pumpkin pie spice for flavor. I also added a pinch of ground cinnamon. Set aside. Once the crust is baked, pour the filling into the crust and tap on counter to remove air bubbles. Bake for 50 minutes - 1 hour. The filling will still be just a bit jiggly, dark orange in color, and have some cracks on the top - this is normal. Remove from oven and let cool completely before loosely covering with plastic wrap or foil and transferring to the refrigerator to fully set for 4-6 hours, preferably overnight. Once cooled, gently lift bars out of dish and slice into 9 bars (amount as original recipe is written // adjust if altering batch size). I also sliced the edges off mine for appearance, but this is optional. Serve with coconut whipped cream and an additional sprinkle of cinnamon, nutmeg, and/or pumpkin pie spice (optional). Store leftovers in the refrigerator up to 3 days, though best when fresh. *I've found almond flour to be generally more expensive than almond meal, but I've found it's worth it for the better texture and flavor. Plus, if you order a 2-lb. bag of WellBee's from Amazon you get a better price. I prefer almond flour in this recipe for lighter texture and flavor, but you can also just sub 1 cup whole almonds or 1 1/2 cups almond meal (amounts as original recipe is written // adjust if altering batch size). *Cornstarch is best in this recipe as arrowroot can give a gummy texture. Stick with cornstarch if at all possible, or try another thickener of choice. *Crust adapted from my go-to Almond Oat Crust. *Filling adapted from my Vegan Gluten-Free Pumpkin Pie. *Nutrition information is a rough estimate calculated without coconut whipped cream. I made these again today. We can’t seem to get enough of them. Used pecans in the crust this time. Yum!! Thanks! I made this as is except instead of almond milk, I threw in a handful of soaked cashews (I had made my own pumpkin puree and it was a bit juicy). It was amazing! Next I’ll try cashew whipped cream with it. I am not usually a baker, and this recipe worked perfectly for me. Dude! These ROCK!! OMG! Thank you! I have missed pumpkin pie and gluten free crusts have not impressed, but these are keepers! Delish!!!! I have made many of your recipes with great success and you are my “go to” for gluten free vegan recipes because I know I can count on success with your recipes. I’ve never taken the time to say thank you. So thank you! You make eating gluten free and vegan a lot less blah!! Going to try creamy pumpkin bars tomorrow. Another wonderful recipe from Dana! I had been craving a great Pumpkin Pie since going vegan and finally found one! This is undeniably AMAZING! The second time I made this the only changes I made was to increase the cornstarch to 3 Tablespoons to make it a little thicker and to add a couple of pieces of candied ginger to the crust. FABULOUS!!!!!!!! Thank you, thank you, thank you! Another easy and tasty recipe! I used canned pumpkin and it turned out great. Next time I will use a food processor for blending the crust and the pumpkin pie filling. I agree with an earlier poster about the 50:50 ratio of crust to pie filling. I’ll use less crust next time and reduce the sugar in the filling and crust. Excellent! Easy to follow recipe and they tasted amazing. Yay! We’re so glad to hear that, Sara! Yummy and easy. I made these for a spontaneous drinks and dessert with my neighbors. I made the crust in the food processor while my hubby made the filling in the Blendtec. It baked beautifully! I only chilled in the refrigerator for 1 hour and it was firm enough for me. Served with vegan vanilla ice cream. Such a nice, healthy, dessert. My only request is an alternative to using coconut oil. Keep these deliciously simple recipes coming! Whoop! We’re glad these were a hit, Pamela! First of all, YUM! We modified the recipe by pressing the crust mixture into the bottom/sides of a 9″ pie plate, and then proceeding with the recipe, adding our own spice blend (a generous amount of ginger, nutmeg, cloves, and cinnamon) to the pumpkin filling. We also reduced the coconut sugar in the filling by about 1/3 and still found it to be sweet enough. The pie set up after about 2.5 hours in the fridge, and when it was time for dessert on Thanksgiving, the crust held up around the edges. The slices went perfectly with a dollop of Cocowhip and a sprinkle of cinnamon. Thanks for another tasty recipe, Minimalist Baker! This dessert was a crowd pleaser! I used roasted acorn squash and it was delicious. I used an 8×8 glass pan. I may try a larger pan next time for a thinner crust. I will definitely make this again. 5 stars! Yay! Thanks for sharing, Michele! Next time would you mind leaving a rating with your review? It’s super helpful for us and other readers. xo! So glad you enjoyed it. I made these for Thanksgiving today – the filling turned out great and set really well, and the ratio of crust to filling was perfect. However, I had issues with getting the crust moist enough. I ended up using 2x more coconut oil than the recipe called for, and it still came out quite dry. I did use a GF flour blend instead of almonds, which I’m sensitive to, so perhaps that’s what was it. They were still delicious despite the crust issue – it was just a pain to try to mix/pulse the crust in my blender because it was so dry. I’m going to try it again sometime! yes, seems like the gf blend was the culprit. Next time you can try subbing another nut or seed meal in place of the almond flour! AHHHH — ok thank you! I will try them again (after I’ve recovered and can eat again). Thanks so much, Dana! Hope you had a great holiday. Excited to make this for Thanksgiving! If I use pre-made oat flour, do i use the same amount? Can you substitute coconut milk or oat milk for the almond milk? And can the crust have dates in it as well? Yes, I’d use oat and dates should work but let us know how it turns out. Good luck! Just want to thank you for this perfect pumpkin food. Love pumpkin, have a highly restricted diet, would eat pumpkin pie year round. This takes it hands down!! Love the pumpkin ratio, that it fits my diet, and is so easy to make. Couldn’t ask for more, Thank You. These are AMAZING and were loved by all my guests at a recent Friendsgiving. The advice on the almond flour is spot-on. I definitely noticed a difference baking with the brand you recommended. These will be a new staple for me during Fall celebrations. Thanks you! Hi, I’m making this for Thanksgiving but my sister has a corn allergy and is celiac so could I replace the cornstarch with a flax egg? Trying to avoid the gummy texture, thank you! I made these along with the pumpkin baked oatmeal and the no-bake pumpkin pie (I had a ton of fresh pumpkin purée to use up). All 3 recipes were amazing! All were delicious and got gobbled up but this one was my favorite. It was perfectly creamy and full of flavor and the crust was light and delicious. I have made a lot of recipes on this blog band there has not been one thing that I’ve made that has not turned out great! You make eating plant-based delicious and easy!! Thank you! This is awesome my 9 year old daughter said. :) And she’s right! I followed the recipe exactly and it turned out as described and pictured. Delicious! I made a coconut whipped cream that didn’t exactly turn out but still tasted great with the bars. I’ll be making this again! I made this recipe tonight and it was a complete and total fail. The crust didn’t mix well in the blender (I wish I had used a hand mixer), and it didn’t spread evenly on a baking sheet, or fill the baking sheet. I ended up using the baking dish that came with my Breville Mini oven, which is about 3/4 size. The pumpkin had a hard film on top and was basically raw underneath, even after putting it back in for another ten minutes, which burned the crust. The taste is so meh I just can’t understand why this came out so poorly when there are so many positive reviews. I might try the crust again but pair it with a pumpkin pie custard that I’ve made for years. This is overall a solid recipe (and easy) but I agree with a few other comments that the crust to pie 1:1 ratio is a bit overwhelming. I suggest halving the crust but I’m not sure how this would influence baking time. I didn’t have any issues with gumminess or a layer of film on top of the pie bars as some other commenters suggested. I baked this on the middle rack in the oven and followed all the directions 100% (aside from adding a touch more cinnamon). Hi Karlen! It sounds like your crust could have used more almond flour and less coconut oil.. I am not sure there is any easy fix at this point but I hope it tasted delicious in any case! Made this yesterday with homemade pumpkin puree. Came out delicious, tho I have to say my man didn’t like it, saying it wasn’t quite enough sweet for his taste. Next time I do this I definitely will make it sweeter. Thanks for the recipe! I am allergic to oats. What can I use instead? How much flour do the oats yield? One cup of rolled oats will yield approximately 1 cup of oat flour. We all enjoyed this! (Husband+3 kids) I substituted gluten free flour for the oats. I halfed the maple syrup and sugar and added 1/4 tsp liquid stevia. It wasn’t overly sweet, but thoroughly enjoyable! It is also easier to make than pie and the crust was excellent! These came out insanely delicious! Followed the recipe exactly as written and the bars have the perfect amount of sweetness and spice. Made this yesterday and can’t believe how incredible they are!! Going to be making these on repeat all fall! I made these pumpkin bars just yesterday. The crust was so heavenly and flavourful. I topped the bars with your cashew buttercream frosting. Recently being gluten free and vegan, I was a little nervous about baking, but wow I has to stop myself after the third piece! Best Pumpkin Pie I’ve ever eaten. I’ve been working my way through several online WFPB pumpkin pie recipies, and this is not just the best of them, it’s the best of any P. Pie ever. To be honest, its the holidays, and I tried to simplify. I used cane sugar, canned pumpkin, and almond meal. It’s what I had. Fabulous. Yay! Glad you loved it + thanks for sharing your changes to the recipe, Judy! I made the pie 2 days after I made the crust, which I kept in the fridge. If THAT works, I think freezing it would be great. I made it! It is pretty easy to make, just long to wait before you try :) very very delicious! Would the almond oat crust be ok if you made it ahead, froze it, then baked it and used it as the recipe instructs? Hmm we haven’t tried it, but if you’re just freezing the crust then I think that would work nicely. Report back on how it goes! Hi! I am looking to use this recipe, but in pie form – would it also work?? Super excited to try them! This recipe came out wonderfully! I did make some substitutions– I subbed AP flour for oat flour and used brown butter/ghee for the butter. It gave the crust a nice nutty taste that complemented the almond flour. After coming out of the oven, the pumpkin bars were dark orange and did have cracks on top, but do not be worried! It tasted well still. I also didn’t let it sit overnight in the fridge, and I cut it after letting it sit 2 hours in the fridge. The pie held its shape well! Would white whole wheat (or whole wheat) flour work instead of the almond flour? I don’t need it to be gluten free. Thanks! Hi Flo! That should work! This recipe is AMAZING!! I have made at least 10 times and it is always delicious! I have simplified the recipe even further, using only oatmeal, almonds, a dash of cinnamon, and a few TBSPs of coconut oil for the crust. For the filling I use two cans of pumpkin, tons of pumpkin pie spice and cinnamon and then two TBSP of cornstarch and a splash of soy milk. I top with a spoonful of coconut whip and it’s honestly the most amazing desert/breakfast/side dish I have had in a LONG time! Thank you so much for the inspiring recipes! Your site is my absolute favorite! ! Thank you for this recipe as I am always looking for ways to use my leftover pulp after making almond milk. Just wondering if you have used still-damp almond pulp in place of almond flour for crust. Thoughts? Hi Dora! We haven’t tried it, but if you do let us know how it turns out! Could you omit the maple syrup or is it necessary? Hi Dana, I am only slightly obsessed with your recipes. Everything you post comes out so awesome. I have these bars in the oven right now as we speak and I expect that they are going to be as amazing as everything else I’ve tried of yours. My only problem with your recipes is when you say that you can keep it in the fridge for up to three days, I don’t know what that means. None of your recipes have made it that long. Hee hee. Made these today and they turned out so well! This is my new foolproof Fall treat and definitely being added to my Thanksgiving menu. Last year I was into a great pumpkin pie bar recipe but it called for 7 eggs (wtf?! ), condensed milk, and some other stuff I’m no longer eating. So thankful to have an awesome recipe to put in its place, thanks Dana! This is a good one guys! If I already have oat flour, can I just use that instead of making my own? 1 cup oat flour? Hi SB! Yes you can! 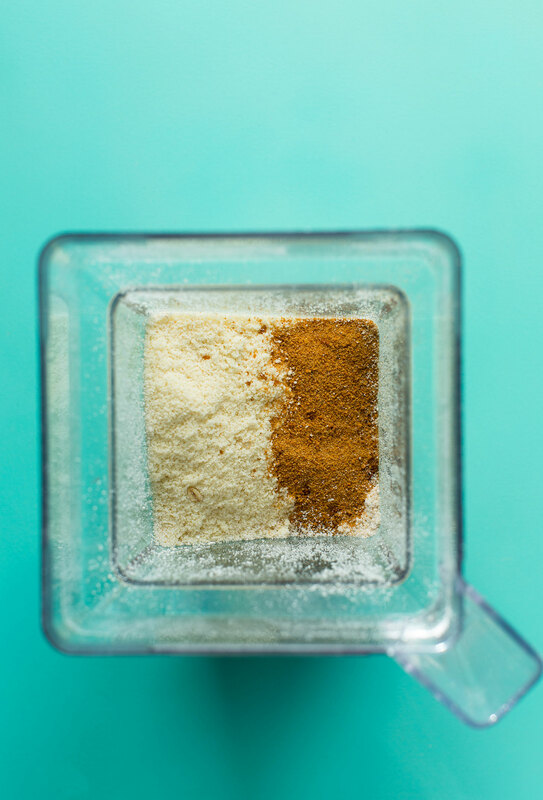 If I’m using oat flour, how much do I use? How much flour does one cup of rolled oats make? Hi Naomi! One cup of rolled oats will yield approximately 1 cup of oat flour. Do you have suggestions for making this nut free? I would love to give this to my son for an afternoon snack at school, but it’s a nut free establishment. Thanks! Hi Kristen! I’d probably recommend a GF flour blend OR coconut flour, or a mix of both in place of the almond flour. Hope this helps! Hi Meredith! I’d probably recommend a GF flour blend OR coconut flour, or a mix of both instead of the almond flour. As for the coconut sugar you can use organic cane sugar would be best, or brown sugar. You can use vegetable oil for coconut oil. Hope this helps! Is there vegan substitute for the coconut oil in the crust? Would just some vegetable oil work? Hi Siri! That should work! What can you recommend for someone with a bit allergy? I like baking with coconut flour but feel like it’s better for bread because it becomes sponge-y, maybe not ideal for crusts though. Just a quick question: Do you think butternut squash can substitute the pumpkin? Hmm it would have a very different flavor, but is worth a try! Report back on how it goes! I made this for my pumpkin spice loving husband’s birthday today, and it turned out really good! We have been trying to be more mindful about what we eat, and this recipe was perfect! Thank you for this recipe! It was so easy to follow and delicious! Can you freeze these bars? Hi Nazira! Yes you can, just bake, cool, then cover well and freeze. Then thaw completely before serving. My daughter is allergic to coconut, can I use another oil? For the crust: I don’t have oil but have unsweetened applesauce, would that work? Hmm, I don’t think so for the crust. You need something that will crisp it up, like fat. Great recipe like usual! Consequently the cook time on the crust was too long for my pumpkin bars and it was darkened quite a bit and a little dry around the perimeter. I think next time I might skip cooking it for the initial time frame (although I only did 15 minutes to start then 50 minutes thereafter), unless you suggest something else? Thanks! Thanks for the awesome recipe! The bars turned out exactly like the picture. This is my favorite pumpkin pie recipe period, and I’ve made others on the blog. This is also going to be my go to pie crust from now on. Has anyone ever put chocolate chips in these? Hi Dana!! I am absolutely obsessed with your blog and your cookbook, your recipes are always so easy and come out amazing!! My husband is g/f and my daughter and I are d/f so your recipes are a godsend when I want something healthy but still super yummy!! This might be a silly question, but if I wanted to make this as a traditional pie would I have to change the recipe/cook time at all?? Thanks in advance! I made this for my first Thanksgiving with my in-laws and it was FAR better than ANY pumpkin pie I’ve EVER had! I will make this every thanksgiving, and hopefully for birthdays in the fall too. I cut my bars into 12 pieces to make it last longer (aka so I could take some leftovers home) and the sizes were perfect. This recipe was the best thing about my Thanksgiving! Everyone loved it, and they had no idea that it was dairy- and gluten-free! I made it as a pie and added a splash of vanilla extract to the filling, which darkened it but tasted really good. The crust is amazing and I want to try it next in an apple or pear pie! Made these for thanksgiving and they were a big hit! I used cashews cause that’s what I had and 2tbsp sugar in crust rather than 3 tbsp and I thought it turned out very tasty. I loved them but I think my two year old was the biggest fan ?. Thanks for all your great recipes! I made these for Thanksgiving and they were fantastic! They blew us all away by how good they were. I didn’t do almond flour but used 1 cup almond meal and didn’t have any issues with the crust. I also went a bit heavier with the spices and also added a splash of vanilla to the filling and they were just fantastic! Will definitely be making these again. Made these today. Crust is awesome. However, the recipe makes a lot of crust. It’s about a 50/50 ratio. I would have preferred more pumpkin filling for the amount of crust the recipe made. I needed to add quite a bit of sweet to get the pumpkin filling to my personal taste. For the amount of time it took to do everything (I roasted the pumpkin), I hoped for a better flavor. Dana, I am trying for a DIY vegan sub for pumpkin pie spice mix for my coffee, like a starbucks type flavor. Any ideas? I have tried some recipes so far, dismal failure, gritty, ended up as pumpkin butter, which is ok but not what I am searching for!! Thanks for the pumpkin recipes, I will start the bars early this morning! Tastes okay, not as traditional pumpkin pie flavored as I was expecting. I measured out everything carefully and my filling turned out darker colored for some reason. As others mentioned in the comments, a film/skin formed at the top which I wish I would have known about before making it! I am going to double this and bake in a 9×13. How long would you recommend baking for a bigger size pan? Thanks! I love all of the amazing recipes you come up with. I have tried many and they never disappoint! I made these last night and just cut into them today. I followed the recipe exactly, using a scale to weigh the ingredients. They taste incredible, but my filling to crust ratio is 1:1, which isn’t like your pic. I think I’d like more filling. I’m planning to make a triple batch (baked in 3 separate pans) to take to a friend’s party tomorrow. If I make 3x the crust, but 6x the filling, how do you think that will affect the baking time/temp.? Thanks! Loved this recipe! It was the perfect thing to bring to Friendsgiving – handheld, not too sweet, amazing crust and group friendly! Thank you for this recipe, I plan to make it for my family’s all vegan Thanksgiving. If I make it two days in advance, will it hold up okay? Do you suggest freezing it and thawing the day of? Hi Tara! How fun. I do think it will hold up. Get it as close to 24 hours to the meal as possible for best results. Otherwise you should be fine! Have fun! How long do these keep for? And should they be refrigerated? They keep for about 3-4 days. And yes, refrigeration is best in my opinion. These look amazing! I love that they can be made vegan and gluten free! I’ll have to see if I can trick my fiancee into trying them! She is a picky eater, so we will see if these make the cut. Definitely going to add these bars to the thanksgiving dessert menu! This was super tasty! I didn’t tell the fam it was vegan and gluten free and not only did they not know the difference, they loved it! We tried this recipe for the first time and the taste was amazing! My wife has the alpha-gal allergy as a result of a lone star tick bite and we now have a pumpkin dessert for Thanksgiving. Is it possible to freeze and thaw for later without change to taste and texture? If so, is there any additional steps we will need to do to ensure the amazing taste after thawing? Hi there! I don’t think so, just bake, cool, then cover well and freeze. Then thaw completely before serving. Love your recipes! 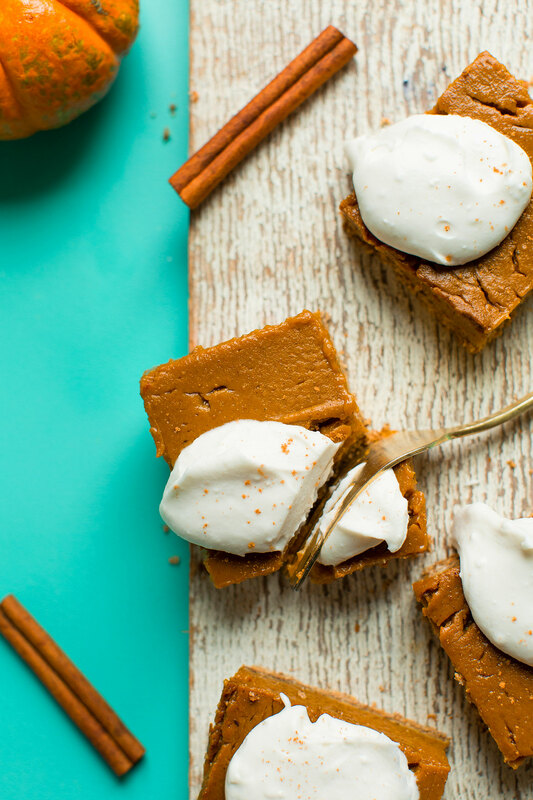 Could I substitute honey for the maple syrup in these pumpkin pie bars? Or do you have another suggestion? Thanks for all the great recipes! Your recipes are always great. I made these today to practice for Thanksgiving, and I sampled two when I meant to sample half of one… the oat crust is PERFECT and the creamy pumpkin is so smooth and delicious. I didn’t put the coconut whipped cream on today but I will on Thanksgiving because I know it’ll take these to the next level, but honestly they’re great without it. This was super easy to make, too. Thank you! Hi Dana! Thanks for your awesome recipes and beautiful photos! I enjoy reading your blog – your posts are always so happy! 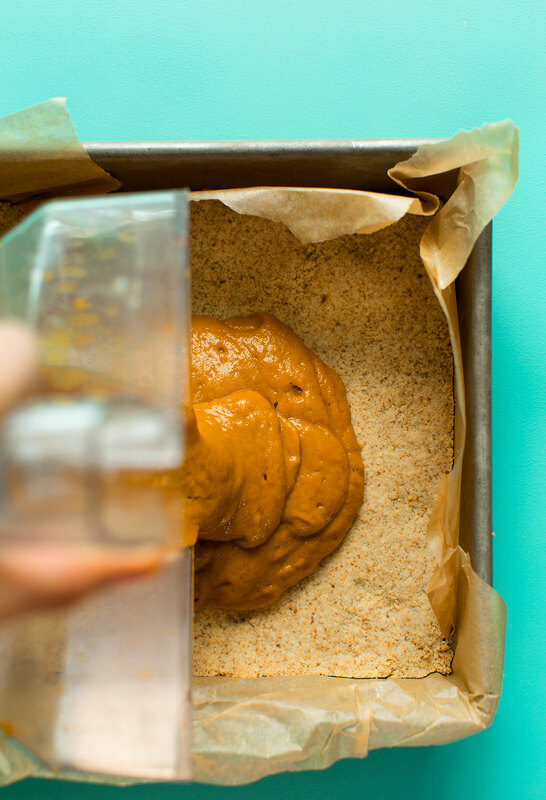 Is there a particular brand of coconut sugar you recommend? I have made this delicious recipe twice now. I added a little cinnamon the second time. Two thumbs up from all tasters! Do you have any desserts/sweets that are gluten free that can be easily prepared / packaged and mailed? I would love to send a friend with dietary retrictions something special this year. Thanks Bobbie! I have several coming up in December that would be perfect for that. Stay tuned! I LOVE pumpkin and these are delicious. I made them on Sunday but after having a bar for lunch just now, I’d say they are even better today. I also got a bit of a skin on the top but I have heard that can be the result of having the shelf up too far up in the oven; next time I will move it down one position and check before the 50 minute mark. Thank you for the recipe! I’m planning to make them again to bring for Thanksgiving so those of us with plant-based diets and GF don’t get left out from all the pumpkin pie goodness. I would love to make these for Thanksgiving, but my fiance is deathly allergic to nuts! I can sub out the almond milk for another plant-based milk, but I don’t know what to do about the almond flour in the crust. Is there a nut-free crust option for me? Hi there! I’d recommend more oats and maybe a seed, such as sunflowers? Otherwise, gluten free or all purpose flour! These will become a fall staple in this house! Thank you! 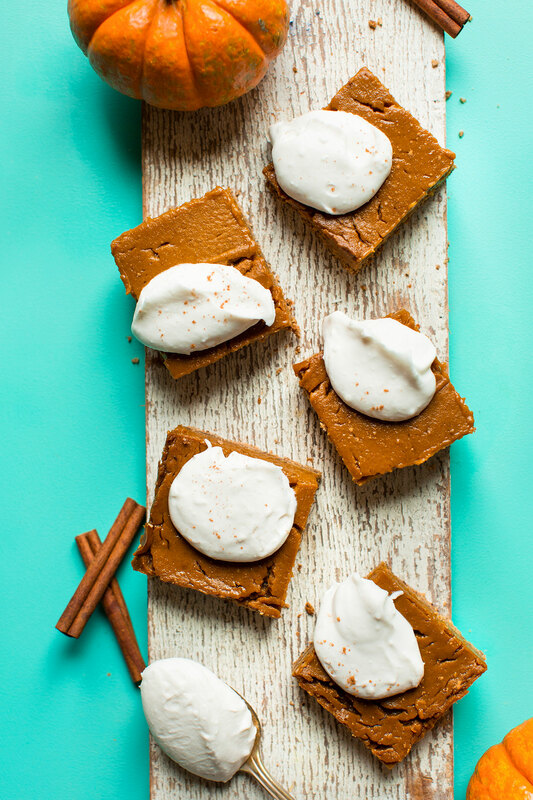 These pumpkin pie bars look really good! What would be happen if I left out the cornstarch/thickener? It wouldn’t thicken and would be soupy. Hey! do you have a nut free gluten free flour you’d recommend? Looking to make these for a friend who’s allergic to gluten, dairy, eggs, and nuts! Thank you! Delicious — and just as good after freezing and thawing! Sounds like just what I am looking for! But is there a particular reason to make it as bars instead of using a pie pan? Pumpkin puree isn’t for sale here (I live in Ireland) though so I am making my own and I have opted to now just using butternut squash instead of actual pumpkin- better availability, workability, price (when the big stores have it on sale I buy a bunch for 50 cents a piece :P ) and taste! I have heard that many canned versions in the US are also not all pumpkin specifically. Is there an advantage to actually using the classic orange round proper pumpkin vs another type of squash (aside from the obvious one that “pumpkin pie” has a much better ring to it than “butternut squash pie” :P )? You could absolutely use a pie pan. That crust looks so delicious!!! Any sort of press-in crust is right up my alley. The whole pie crust rolling thing just doesn’t agree with me! And that gooey pumpkin topping looks absolutely divine!!!! I am adding this to the list. The 4:30 prep time is a little intimidating, it this including time to cool? And does that mean it only takes about 30 minutes to prep excluding cook time and cool time? Trying to figure if I have time to make this before a friends-giving dinner coming up soon. Thanks! That should be enough time, but if you’re worried you can make it a day in advance!! I made these this afternoon, and the flavor is fine… although the filling got very dry on top and formed a “skin” even thought it only baked 50 minutes. Didn’t crack as expected and it’s tastes a bit gummy, but not creamy. Followed the recipe exactly, so not sure what the issue was? I’ve been baking gfdf for years…thanks so much for all your delicious recipes! Yes, the same thing happened to me… wasn’t sure if it was too much arrowroot? I stuck to the recipe, but I wonder if it would have worked better with either more liquid or less starch. The recipe says arrowroot will give a gummy texture. For the first batch I made it with the directed amount of liquid because it was too heavy. The second one I added almost double the liquid. Also used regular sugar in the crust and in the pie, I blame my less refined palate. Happy thanksgiving! Hmm, did you use arrowroot? That may be the issue…I’ve used it in puddings before and it can make a skin. Sorry about that! I’d recommend cornstarch next time. Yes, I have a corn allergy so I opted for the arrowroot listed in the recipe. Would tapioca work better maybe, if I can’t use cornstarch? Ah! I’ll try again with cornstarch!! :) Thanks for the fast response!! Hi there! Tapioca might be the next best option. Let me know if you give that a try! I used cornstarch and followed the instructions to a tee! So not sure why the difference! Looks amazing and delicious, great recipe! Can I ask you a question about your recipe plugin? Is it easy recipe plugin and if so, is it still working properly? I had many problems with that plugin like recipe disappearing! Did you do anything particular to solve this issue? A post would be really interesting as many of us had to change the plugin! I pre ordered the cookbook plugin and I can’t wait for it to be finally released ! Hope this will be my happy ending with the recipe plugin drama ? Super yummy!!! I just made this today using my blendtec blender. Super easy. Thanks for the recipe. I had never heard of pumpkin pie bars. I will be making these regularly! I made these today with cooked pumpkin from my garden. They were absolutely delicious! I could not stop eating them. I have tried many of your recipes and every one never disappoints. Another great recipe to add to my list of keepers. Lovely! Thanks for sharing, Angelica. You are fabulous! 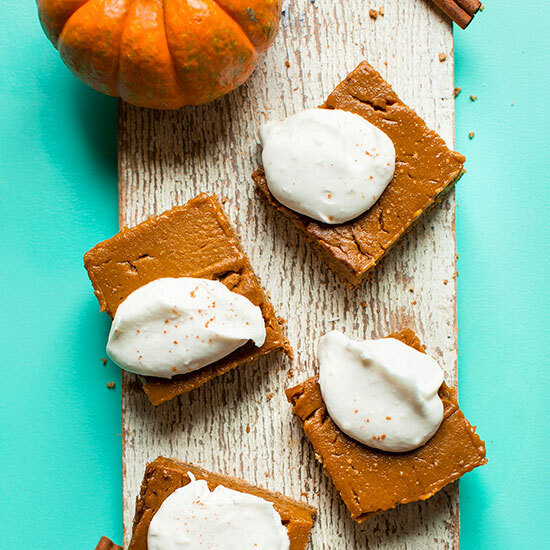 I am always afraid that after so many Fall seasons we will run out of new, fun, yummy pumpkin recipes, but here you are with a new delicious pumpkin bar. I will definitely be trying this recipe before Thanksgiving. Love it! Please do more recipes for Celiacs. I am vegan, gluten free, wheat free, corn free, soy free & oat free. How can I leave out the oats you do without ruining the recipe? I love what you do, please keep up the great work. There is a gluten free oat brand called nature’s path old fashion gluten free oats they make a regular oat as well I have celiac to and never had a problem with these oats. Hi there! I’d suggest subbing gluten free flour blend. Good luck! Wow these look delicious!! And thanks for the tips about almond flour! Your recipes are awesome! Since I am from Germany and believe or not you can not buy pumpkin purée at the store: how do I do it by myself? Do you have a recipe? I’d love to try this cake! Slice a small piece of skin off the one side of the pumpkin so when laid on its side, the pumpkin will lay flat without rolling (this step isn’t super necessary if you’re using the small sugar pumpkins). Remove the stem and split the pumpkin in half from top to bottom, using a large cleaver and a mallet. Scoop out the seeds and fiber with a large metal spoon or ice cream scoop. Cut the fibers with kitchen shears if necessary. Reserve seeds for another use. Sprinkle the flesh with kosher salt and lay the halves, flesh side down, on a parchment paper-lined half sheet pan. Roast until a paring knife can be easily inserted and removed from the pumpkin, 30 to 45 minutes. Test in several places to ensure doneness. Remove the half sheet pan to a cooling rack and cool the pumpkin for 1 hour. Using a large spoon, remove the roasted flesh of the pumpkin from the skin to the bowl of a food processor. Process until the flesh is smooth, 3 to 4 minutes. Store in the fridge for up to 1 week or freeze for up to 3 months. I just take a whole butternut pumpkin wrap it in tin foil and roast at 150c for an hour. Once cooled slice in half and scoop the flesh out. Voila sweet pumpkin purée. I prefer to roast as it makes it sweeter. I used to make my daughters baby food like this too. It looks insanely delicious! Thank you for another fantastic creation. On a side note can a request be made maybe for a Christmas inspired salad or a festive pie please? Something orange-y, aromatic… ’tis the season… Thank you! Happy creating. Lovely! Added to the list. Thanks Monika. Could I use a sugar other than coconut sugar? Or do you recommend sticking to the recipe? Thanks! Excited to try these! Yes! Organic cane sugar would be best, or brown sugar. I was thinking maybe I could use xylitol, my mainstay? I’ve gone the whole crustless pumpkin pie route in the past and it’s okay, but zero crust is kind of lackluster and sad! I mean you want the crust right. I’m really excited about trying your oat-y version! We love your recipes! For this recipe, can you use another flour or coconut crust instead? We have a nut allergy. Hi Natasha! I’d probably recommend a GF flour blend OR coconut flour, or a mix of both. Good luck!